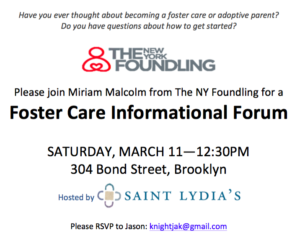 Please join Miriam Malcolm from the New York Foundling for a foster care informational session. Miriam will answer any and all questions and speak to attendees about the foster/adoption process in NYC. This event is open to EVERYONE who has ever considered becoming a parent through foster/adopt. Thank you for helping us spread the word!